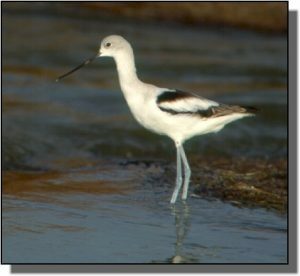 Description: A large-bodied, pigeon-sized shorebird, the American Avocet has long, blue-gray legs and a long, slender black bill which curves upwards. There are two distinct plumages. Breeding adults have an orange head, neck and chest, with black and white wing and back markings. During the nonbreeding season, the orange is replaced by gray. Similar Species: Within the Great Plains, this species shouldn’t be confused with other shorebirds. Occasionally, American Avocets are seen swimming or floating in deep water and behaving in a fashion similar to Wilson’s Phalaropes. 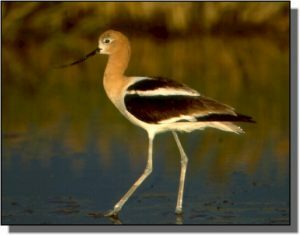 Comments: American Avocets are found in wetlands throughout the Great Plains during the breeding season and migration. Often seen in large flocks, they wade through high water scything their bills back and forth to collect aquatic invertebrates. Males can be distinguished from females by a comparatively straighter bill.